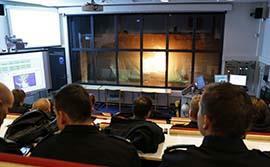 In the maintenance buildings on the Emergency Services College’s training ground, there is a fire theatre built in 2005, which is a simulation space intended for the demonstrations of fire development and the functions of fire protection devices. The fire theatre includes an auditorium that seats 45, a burn space and a device space. Its purpose is to illustrate how a fire develops, the behaviour of different construction materials to fire and the function of technical fire prevention devices, while the demonstrations can be observed safely at the same time. Test burns set in the burn space can be safely viewed from the auditorium from behind a fire proof glass, as if one were in a theatre. 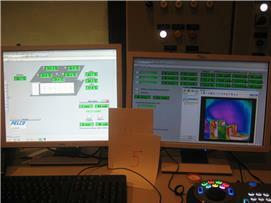 The fire theatre is equipped with devices which allows to measure temperature and time of demonstration burns, to estimate smoke volume with fire detectors, to use and test the most common fire detectors of fire detector systems, as well as three fixed extinguishing systems: a water sprinkler system, the Softex film-forming foam system and the Hi-Fog water mist system. The fire theatre also has an automatic smoke exhaust system. Currently, the fire theatre is used to demonstrate how fires develop as part of apartment fire instruction, to demonstrate smoke ventilation as part of rescue operation instruction, and for tests that supports the theories in the instruction of structural fire prevention. Also, it is used for the instruction of technical fire prevention devices to model and illustrate the use of them. The fire theatre is an important live observation and modelling site. An effort is being made to expand, increase and develop its use..
Model the development of apartment fires. Model smoke formation and the behaviour of combustion gas. Model smoke ventilation done by fire brigades. Demonstrate the use, rapidness and effectiveness of fire detection devices and fixed extinguishing systems. Demonstrate the importance of smoke ventilation and the functions and effectiveness of smoke exhaust systems. Demonstrate how different construction materials burn. Make test burns on structures that are computationally measured and designed and compare the results to calculations. Burn typical wall structures that function as a fire compartment and compare their behaviour and the duration of burning to the ratings they are received in tests. Demonstrate the purpose and significance of important fire-technical design of structures to those who produce them such as construction sector students. Demonstrate the functions and use of technical fire prevention divices for students completing vocational qualification studies in the security sector, who will be employed as guards and play an important role in securing the safety of public spaces (shopping centres etc. ).